The first began in 1967 and ended in January 1981. The second began in 2001 and is still in progress. Here’s what happened in the first secular gold bull market. 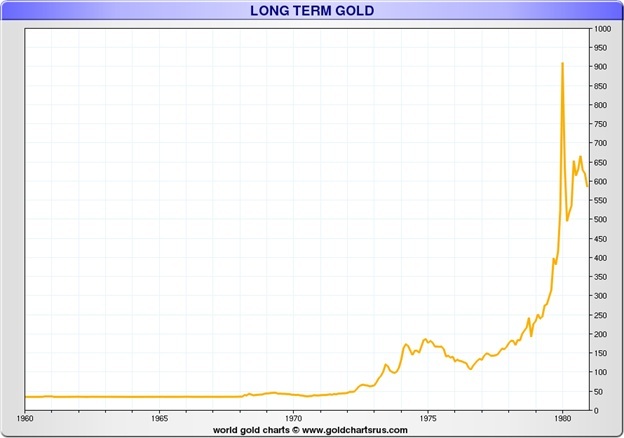 Since 1934-1967 the US maintained the Gold Standard by keeping the gold price at a rock solid $35/oz. However, in late 1967 the Governors of the Central Banks of Belgium, Germany, Italy, Netherlands, Switzerland, United Kingdom and the United States convened in Frankfurt on November 26, 1967. There were severe accusations of Gold Price Suppression, Currency Swaps, Assorted Market Manipulations and Interventions. The upshot of this meeting released the heretofore iron hold of the gold price at $35/oz. Consequently, slowly but surely the gold price began to rise. Ergo, the first secular gold price bull was born. 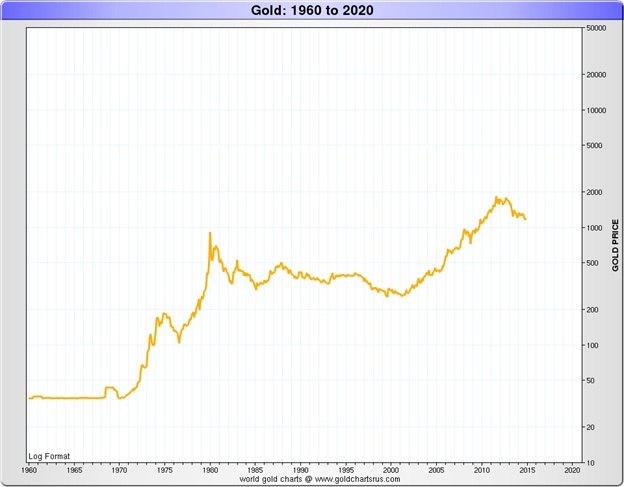 The first chart below shows how the gold price continued rising from 1967 to its peak in 1975. Gold had effectively risen +457% in eight years ($35 to $195/oz). And as will happen in all secular bull markets, the gold price entered into correction. 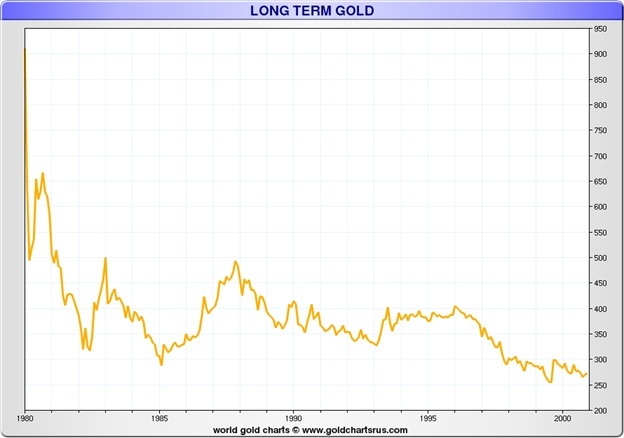 Subsequently, the gold price declined -49% -- and bottomed at $102/oz in 1976. The gold price forecast shown below is based upon gold price history and data of its two previous bull markets as detailed above…and their respective Compound Annual Growth Rates (CAGR). The price of gold is presently bottoming in the $1,200 area. The next leg up in this secular bull market might project an average of the two aforementioned secular bull runs…that is to say the CAGR for gold might be +48% during each of the next six years. Secular Bull Gold Forecast could possibly reach $12,600 by 2020. Increased likelihood of a US recession…and a market crash due to grossly over-valued stocks. The probability the Euro Union will implode, thus trashing the value of the Euro currency. Major world Central Banks are increasingly buying more gold for their nation’s reserves. Peoples Bank of China methodically continues to pursue its covert objective to replace the US$ with the Renminbi as the world’s reserve currency…and to dramatically reduce its US$ FOREX risk. Russia’s Putin sparks World War III over the growing turmoil in the Ukraine. Inflation and interest rates might soar as they did in the late 1970s under President Jimmy Carter, when gold price soared +507% ($140-$850) from 1977 to 1981 (a CAGR = 56.9%). In the first secular gold bull market, the number of investors in gold reached 5% of total investors worldwide. Today only about 1% of investors worldwide invest in gold. But as gold begins to rise, investors globally will again flock and stampede into the shiny yellow…thus fuelling the gold price into the stratosphere…where no man has gone before!!! Growing Global Gold Demand continues to outpace flat mining Supply. Prices must rise. Possible future currency devaluation contagion among all major countries. Internet marketing is instantaneous…allowing for worldwide communication of all the above. What effect might a much higher gold price (i.e. $12,600/oz) have on Gold & Silver Stocks (HUI Index)? History is testament the HUI Index is much more volatile than gold itself (i.e. on the upside and on the downside). In deed and fact the HUI/Gold ratio is today (0.14) as low as it was in 2001 (when the present secular bull market made its debut into the international investment world (see chart below). Consequently and in the event gold soars to the above $12,600/oz secular bull market forecast, the value of the HUI/Gold ratio might conceivably again reach 0.60 as it did in 2003, 2004 and 2006. And therefore the value of the HUI Index will have soared exponentially to about 7560. That means HUI’s value will have increased about 3,900% from today’s value of only 165. Indeed…a once in a lifetime opportunity. $10,000 Gold, Is it Possible? Gold Price Forecast for Next Six Months: Buckle Up!